HAND IN HAND. Sen Bong Revilla of LAKAS-CMD partners with Gov Jonvic Remulla, head of Partido Magdalo. September 25, 2012. KAWIT, Cavite - A day after President Benigno Aquino III and the Liberal Party (LP) endorsed 3rd district Cavite Rep Erineo "Ayong" Maliksi for the 2013 gubernatorial post in this province, Sen Ramon "Bong" Revilla Jr of Lakas-CMD joined the local Partido Magdalo in endorsing incumbent Gov Juanito Victor "Jonvic" Remulla, who is seeking re-election. The rally on Tuesday, September 25, at the Island Cove Resorts here also formalized the local partnership of the 2 parties, although Magdalo is officially affiliated with another national party, the Nacionalista Party. In fact, NP heads Sen Manuel Villar Jr and his wife Cynthia were at the event. 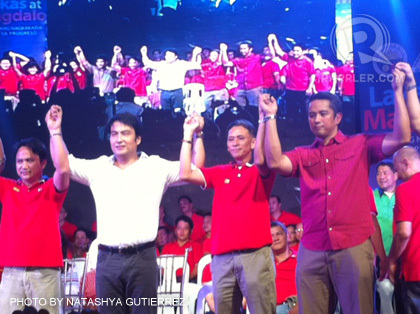 Revilla's son, Ramon "Jolo" Revilla III, will be Remulla's running mate in 2013. That Magdalo is being sought by national parties as a strategic partner in Cavite is not surprising. Founded and built by Jonvic's father, former Gov Juanito Remulla, it has a reliable machinery that delivered for allies in past elections, and is considered one of the strongest province-based parties in the country. It wasn't surprising either that Lakas, which Revilla heads, sought a partnership with Magdalo. Lakas isn't fielding a senatorial slate and is focusing on winning local races throughout the country. The Revillas and Remullas have worked together before. Magdalo has been nationally affiliated with the NP since 2010, too. However, there will be limitations to what Magdalo will choose to deliver for NP in the national races in 2013. This because NP at the national level has coalesced with the LP, under whose banner Cynthia Villar will run for senator. This national alliance will definitely not reflect on Cavite. Local politics, after all, is different, Villar said. "Ang LP and NP coalition are okay naman, intact naman. May mga free zones na hinahayaan na lang namin (The LP and NP coalition are okay, intact. There are freezones that we just let be)," Villar told reporters. "Dito kasi (sa Cavite), ang Nacionalista ay Nacionalista, ang LP ay LP lang… hindi natin masasabi kung ano ang takbo dito sa free zone (Here in Cavite, a Nacionalista remains a Nacionalista, an LP is an LP... we can't tell what will happen here in a freezone)," he added. Cavite has about 1.6 million voters, one of the highest in the country. Excluding the National Capital Region, it is ranked second only to Cebu in number of registered voters. Cavite's races are expected to be among the hottest come 2013, primarily due to the keen interest being demonstrated by national officials in the Remulla-Maliksi fight. According to Mrs Villar, the LP and NP had agreed before coalescing to go their separate ways in free zones, such as Cavite, where the 2 parties are divided. "President PNoy and Senator Villar talked about the coalition. 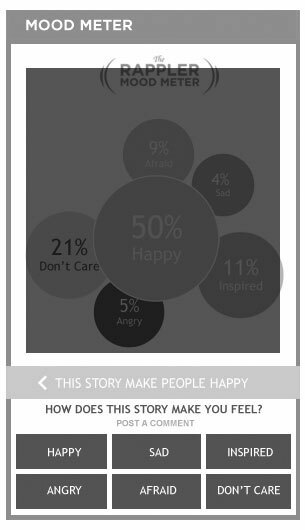 Ganito na 'yung Cavite, wala namang misrepresentation doon," she said. "They talked about it, and the President said, 'We'll go our own way in Cavite.'" NP spokesperson and Jonvic's brother Jesus Crispin "Boying" Remulla agreed, saying they did not even push for the "equity of the incumbent" rule for the province when it coalesced with LP, because Cavite is a special case in how distinctly different LP and NP are. If the "equity of the incumbent" rule is applied, Remulla would be supported by the LP-NP coalition. "That is not applicable to Cavite since the NP and the LP here have been diametrically opposed to the point of dividing the province almost equally between us. 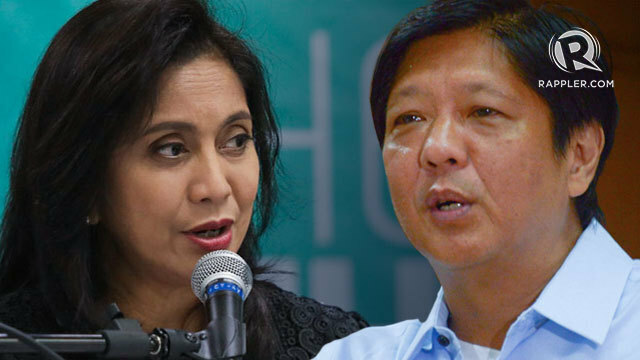 So it cannot hold," he told Rappler. "All politics is local. And in this case, we can see that in every place, there's a distinction between the two parties." CAVITE'S GOVERNOR. 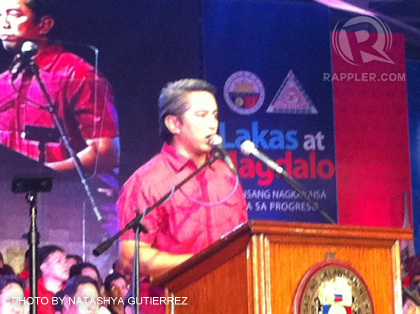 Incumbent Gov Jonvic Remulla speaks to hundreds of Caviteños in attendance to support the Lakas-Magdalo partnership. September 25, 2012. Remulla said that while the NP and LP will be fielding a senatorial slate together, locally it is not viable for senatorial bets to stand on LP's stage nor the Lakas-Magdalo stage. "It would be a conflict of sorts. We would rather have [San Juan Rep] JV Ejercito stand here with my fellow NP people and maybe [Sen] Gringo Honasan than the LP people," he said. Both Ejercito and Honasan are senatorial candidates of the national opposition group led by Vice President Jejomar Binay and former President Joseph Ejercito Estrada, the United Nationalist Alliance (UNA). Several weeks ago, in a town gathering in Silang, one of the vote-rich towns here, former President Estrada endorsed Jonvic Remulla before a crowd of thousands, saying the the province will always be in good hands as long as the Remullas are at the helm. Crispin Remulla added that while the LP-NP alliance will be retained in many areas across the country, for areas of conflict, declaring them as free zones is essential. "That's the best way to run it so we can be honest with each other that we are not being hypocrites, by saying we support somebody but will not vote for them," he told Rappler. "We might as well start by saying this is our party, and these are our people. At least we're honest to ourselves and to the people we represent." Remulla clarified that while NP will not stop LP senatorial bets from campaigning on Lakas-Magdalo's stage, he predicted that a lot of them will not feel comfortable doing so. 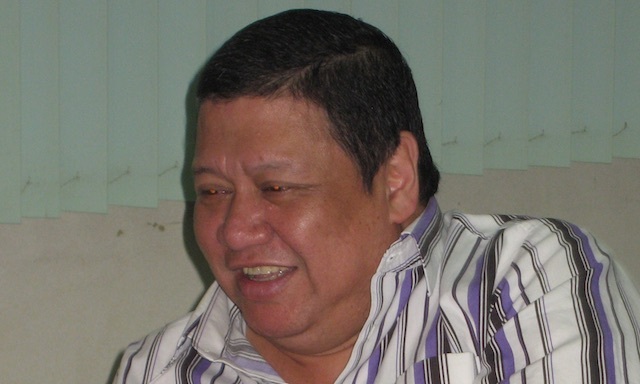 He cited LP's senatorial bet Jamby Madrigal as an example, a politician who is "diametrically opposed to the NP." In contrast, he said NP members and re-electionists Antonio Trillanes IV and Alan Peter Cayetano, as well as UNA's Honasan, Ejercito, and Ernie Maceda all of whom they are "close" to, can expect that the doors will be open to them. He added: "It will also depend on the local politics. There are some municipalities that have special relationships with the senators. Who are we to stop them?" CAVITE SUPPORTERS. 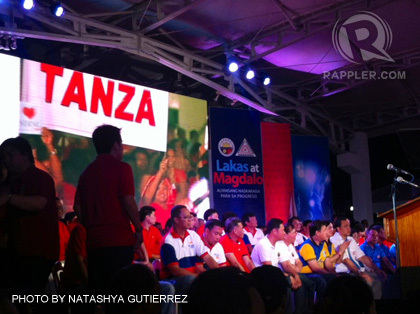 Lakas-Magdalo candidates for the 2013 local elections fill the stage in Kawit, Cavite. September 25, 2012. "But as far as we're concerned, I know where my feelings lie and I will not lie about my feelings," he said. As for Lakas-CMD, which will not be fielding senators in 2013, Revilla said the party has yet to discuss the candidates they will endorse, but admitted that those in the rally could expect their support.